So a few weekends ago I carved a hole into the end of the hedge. 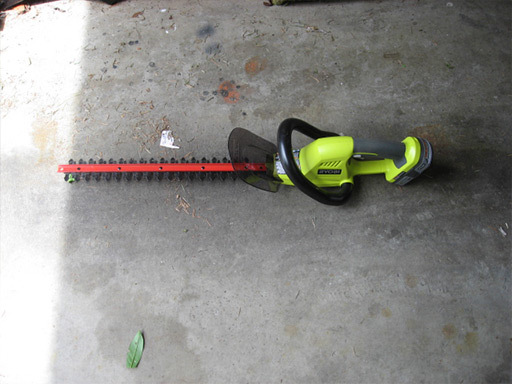 It took me about an hour, equipped only with the level 1 hedge trimmer that we found in the garage on closing day. My own dear Dad recommended this brand for its use of lithium batteries and the interchangeable-ness of the batteries between multiple Ryobi yard appliances. As we expand our tool collection (ALL THE TOOLS!!) it’ll be nice to need only one type of battery that all the machines can share. That, and the whole no-gasoline/no-oil thing is right up my alley. As it turns out, the madness that overtakes me when I have a paintbrush in hand (inspiring me to paint EVERYTHING in sight) also applies to hedge trimmers. VRROOOOOOM! 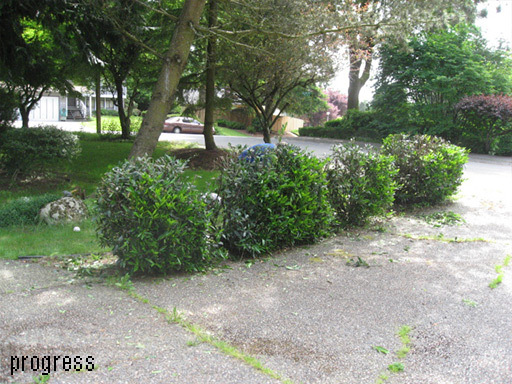 An hour later I’d reduced our hedge to its individual components. It even yielded some loot in the form of a tennis ball and a wiffle ball. The mad rampage of hedge trimming was ended when the battery ran out of juice. I suppose an hour or so of hedge annihilation really ought to be enough for anyone. 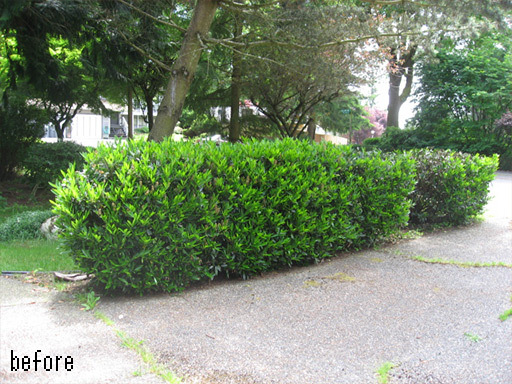 What the hedge now lacks in artistry it makes up for in functionality! I finally feel good about backing up off my own driveway.